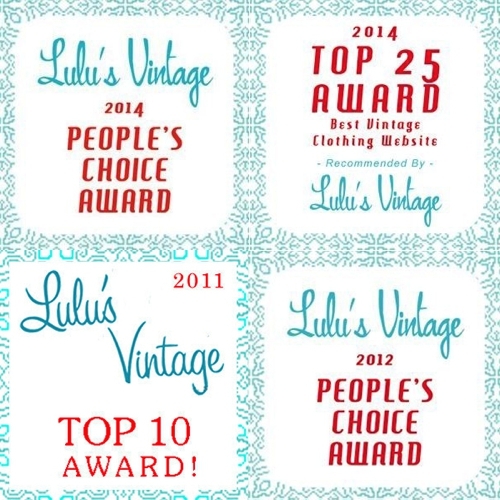 We were very pleased to have been chosen several times as one of the Top 10 in the People's Choice Awards for vintage websites hosted by Lulu's Vintage Blog--all thanks to our lovely customers! AND, we also made her personal Top 25 vintage clothing websites list--thanks Lulu! Check out this great blog about vintage by clicking here. In 2013, Viva Vintage Clothing was also featured in "The 100 Best Vintage Shops Online", by Sammy Davis Vintage. Yipee! In 2012, Viva made racked.com's "Vintage38" list. In this list of the top 38 online vintage shops, they "rounded up 38 sites with excellent authentic finds you can score from the safety of your couch." Sounds good to us! We have also made it onto several top vintage shops of Chicago lists, over the years. Thank you, to our beloved local customers! A few kind words about Viva Vintage Clothing from our customers...we're blushing! "My package arrived quickly and safely. I am really impressed with the care you took to communicate my order, as well as the attention you gave to the shipping and packaging. The items you sell really look like they have been carefully handpicked. I couldn't have asked for a better shopping experience, and I will be sure to shop back at your website again." --Melissa R.
"My dress and hat arrived today-one day after my purchase! Both pieces fit perfectly and are in excellent condition. Thank you for taking the time to talk with me to ensure that the dress would fit perfectly and to ensure that I selected the correct accessories. You provide the wonderful combination of exquisite vintage pieces and exceptional customer service." --Randi A.